Saturday 22. 08. 15 Because I have enjoyed drawing Le Rhônel I thought that I would try a drawing on canvas and then paint it with thin glazes allowing the drawing to show through. The above is the result. I think more experiments are in order. 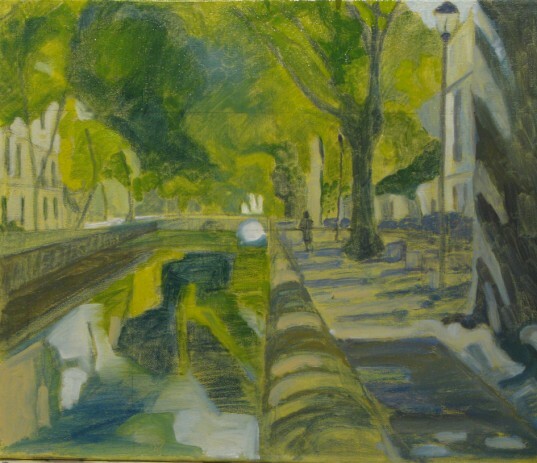 Have really enjoyed looking at your various monoprint / drawing / painting experiments on the subject of the canal. It must have captured your imagination! Am slowing working my way to the end of the rewrite of The Secret History of John A. Expect to have it ready by October.